Diamond Quality begins with the inspection of the diamonds themselves. Fore, the basis of determining whether your most desirable gemstone's worth is valuable, it is important for you find out the 4C's and key essentials of your precious gems. You can find this information from GIA (Gemological Institute of America), Diamond Merchants, and Jewelers. A certification of authentication on the diamond comes with your purchase. The certification tells you the diamond is real, therefore, the diamond quality is very high. The 4C's for the diamond lets you know about the quality of the stone. 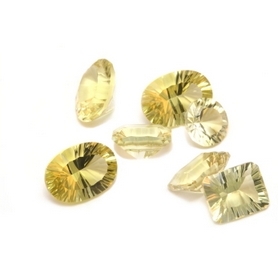 Clarity, Color, Cut, and Carat are grades for gemstones. 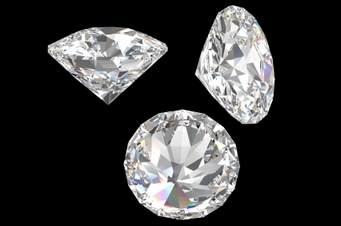 With clarity, diamonds have identifying phyiscal characteristics. 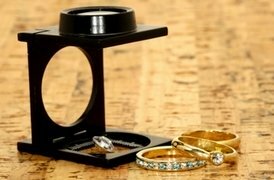 Professionals use a 10x magnifying loupe to view these stones in order to see whether there are inclusions inside them. Shoppers are advised to be aware of the five categories in class for clarity grades. The Clarity grades are as follows: FL=Flawless, IF=Internally Flawless, VVS1, VVS2=very, very, slightly imperfect, VS1, VS2=very slightly imperfect, S1, S2=slightly imperfect, I1, I2, I3=imperfect. This chart will rate diamond quality before you buy. Of course that's the clarity grade, the color, cut and carat, that'll allow you to determine authenticity of the diamond as well. The Color grading scale ranges from D to Z. D for colorless and Z for light yellow. After Z a diamond is considered to be "Fancy" color or exotic. Colors of gemstones can be so vague until it is almost impossible to tell the differences except by the trained eye of a gemologist. Gemologist places a diamond on a white background next to another diamond that has been graded previously in order to grade the diamond's coloring, if the diamond has less color, then it is graded higher on the color scale, it's quality and price are very high. However, when the amount of color increases, the price and quality of the diamond decreases. 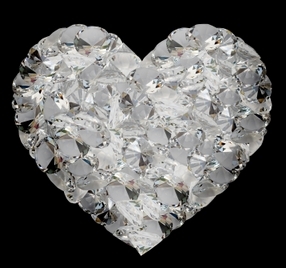 Carat of the diamond is the measure of its weight. It can be divided into 100 points. If a carat is 0.25, that means it is 25 points. Larger diamonds are rarer than smaller ones, so, the value increases tremendously with a diamond's carat weight. The Cut of the diamond also increases the quality and price value. A diamond cut refers to two phases, the first is the diamond shape (i.e. oval, round, princess, etc.) and the second phase is the actual cutting work by the cutters. If a diamond is cut right, the fire (a beautiful rainbow colors that flash within) and the brilliance (the liveliness and sparkle) will show, as well as, the size and color. The better the cut is, the more brilliant the diamond and different cuts reflect the light in different angles, this makes for better quality in the diamond.